This product is not a hardware device. What is it? The S90 XS must be purchased separately. This product facilitates use of the S90 XS in Sibelius. IT IS NOT A SOUND DEVICE and DOES NOT CONTAIN ANY SOUNDS. 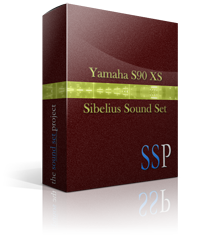 To purchase the S90 XS device, please visit the Yamaha website. S90 XS © Yamaha Corporation. All the latest Sound Set Project news, releases and exclusive subscriber deals straight to your Inbox. Copyright © 2019 The Sound Set Project, a division of Sound Notes LLC. All Rights Reserved.